This July, Cono Sur will continue to be Official Wine Partner to the most famous cycling event of them all: the Tour de France. The Chilean winery will in June release their 2017 Limited Edition Cono Sur Bicicleta labels onto the Irish market in celebration of the winery’s ongoing association with “La Grande Boucle” (aka the Tour de France). Each bottle features new artwork exclusively commissioned by esteemed British artist Eliza Southwood, with her distinctive style celebrating the beauty, energy and elegance of cycling. 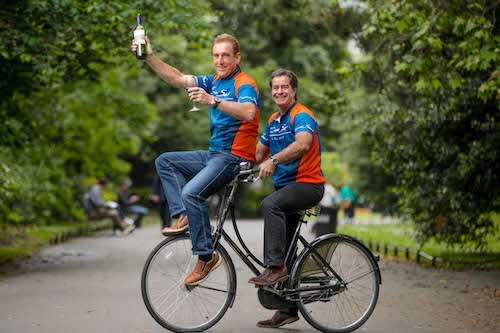 Pictured above is Irish cycling legend Seán Kelly with Cono Sur Chief Winemaker Adolfo Hurtado on St. Stephen’s Green in Dublin, where they celebrated the partnership in idiosyncratic fashion. The new limited edition Cono Sur Bicicleta labels feature different-coloured versions of exclusively-commissioned artwork by British artist Eliza Southwood. Cono Sur was the world’s first carbon-neutral winery, and the bicycle has become a symbol that honours their employees and represents their commitment to developing a viticulture both in excellence and with respect for the environment. As a result, Bicicleta, Cono Sur’s most popular range, is named after the bicycles their workers use to get around the vineyards, helping to keep their carbon footprint low and their grapes at optimum quality. The Cono Sur Bicicleta wines have an RSP of €11.99 and are widely available nationwide.